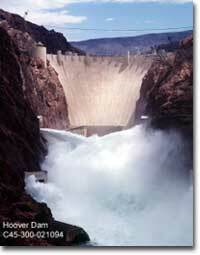 At the time of its construction during the Great Depression, the Hoover Dam was the largest in the world. To this day, it uses the power of the Colorado River to electrify the region. How effective was the New Deal at addressing the problems of the Great Depression? No evaluation of the New Deal is complete without an analysis of Roosevelt himself. As a leader, his skills were unparalleled. Desperate times called for desperate measures, and FDR responded with a bold program of experimentation that arguably saved the capitalist system and perhaps the American democracy. As sweeping as his objectives were, they still fundamentally preserved the free-market economy. There was no nationalization of industry, and the social safety net created by Social Security paled by European standards. Observers noted that his plan went far enough to silence the "lunatic fringe," but not far enough to jeopardize capitalism or democracy. FDR's confidence was contagious as millions turned to him for guidance during their darkest hours. His mastery of the radio paved the way for the media-driven 20th-century Presidency. His critics charged that he abused his power and set the trend for an imperial Presidency that would ultimately endanger the office in future decades. 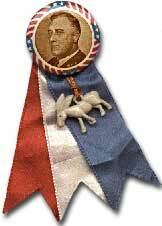 This Franklin D. Roosevelt campaign pin features a donkey, the symbol of the Democratic party. The New Deal itself created millions of jobs and sponsored public works projects that reached most every county in the nation. Federal protection of bank deposits ended the dangerous trend of bank runs. Abuse of the stock market was more clearly defined and monitored to prevent collapses in the future. The Social Security system was modified and expanded to remain one of the most popular government programs for the remainder of the century. For the first time in peacetime history the federal government assumed responsibility for managing the economy. The legacy of social welfare programs for the destitute and underprivileged would ring through the remainder of the 1900s. Laborers benefited from protections as witnessed by the emergence of a new powerful union, the Congress of Industrial Organizations. African Americans and women received limited advances by the legislative programs, but FDR was not fully committed to either civil or women's rights. All over Europe, fascist governments were on the rise, but Roosevelt steered America along a safe path when economic spirits were at an all-time low. However comprehensive the New Deal seemed, it failed to achieve its main goal: ending the Depression. In 1939, the unemployment rate was still 19 percent, and not until 1943 did it reach its pre-Depression levels. The massive spending brought by the American entry to the Second World War ultimately cured the nation's economic woes. Conservatives bemoaned a bloated bureaucracy that was nearly a million workers strong, up from just over 600,000 in 1932. They complained that Roosevelt more than doubled the national debt in two short terms, a good deal of which had been lost through waste. Liberals pointed out that the gap between rich and poor was barely dented by the end of the decade. Regardless of its shortcomings, Franklin Roosevelt and the New Deal helped America muddle through the dark times strong enough to tackle the even greater task that lay ahead. This government-sponsored website on Social Security is as big as the program itself! 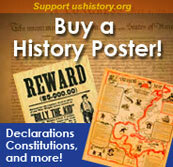 "Social Security History" traces the origins of the program and its evolution to the present day. Get your fill of information from all eras of Social Security history from the 1930s to the 1990s, and feast your eyes on a plethora of pictures. This document from the Institute for Cultural Democracy examines FDR's New Deal programs that helped foster creativity and the arts. While some wanted to "get the government out of the theater business," others saw the societal and cultural benefits of putting artists, actors and musicians to work. It's all text, but it's excellent and informative reading. During the 1920s, 20 million stockholders sought fortunes in the stock market. About half of the 50 billion dollars in securities offered during this time became worthless.